Sosua in the Dominican Republic is renowned for its breathtaking beaches and spectacular diving making it a fantastic place to learn the Spanish language. 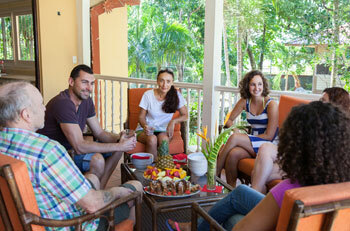 Study at our language school in the Dominican Republic and learn Spanish in a beautiful environment. Learn to dive, windsurf and kitesurf in the Dominican Republic while you learn Spanish in Sosua. 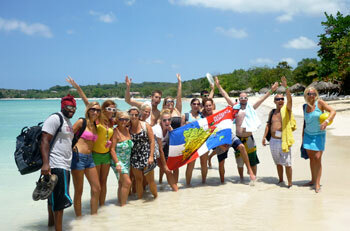 If you would like to study abroad at a Spanish school with international students, Sosua is the ideal location. Students can stay in the school’s on-site residence, just 5 minutes’ walk from the beach, in high standard private apartments, in shared apartments or in 2 or 4 star hotels, complete with swimming pools. Save 20% on the cost of all Spanish courses in Sosua. Offer also applies to accommodation in on-site shared apartments or studios! Our Spanish language school in Sosua, Dominican Republic offers the opportunity to learn Spanish in a beautiful beach location. Our language school is ideally located just 5 minutes’ walk from the beach in Sosua, perfect for students who want to learn Spanish and get a tan! You can learn Spanish on a ‘Standard’ Spanish course of 20 lessons/week, or on an ‘Intensive’ Spanish course of 30 lessons/week. With a maximum of just 7 students per class, each student gets lots of individual attention. Our Sosua Dominican Republic school also runs a ‘Spanish and Windsurfing’ and ‘Spanish and Kitesurfing’ course, with 20 Spanish lessons/week, plus 9 to 15 hours of windsurfing/kitesurfing lessons. Spanish language lessons, all equipment and instruction are included. 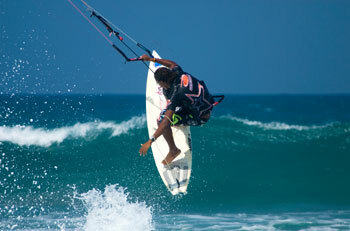 So, why not come to the Dominican Republic, learn Spanish and learn to windsurf/kitesurf at the same time! 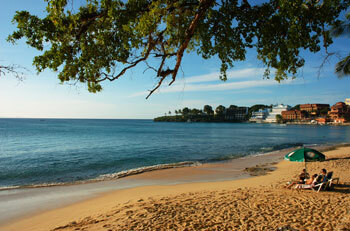 Sosua is also the ideal destination for scuba diving. It hosts 19 different dive sites, all located just 5 to 20 minutes from the beach. With such a wide selection of dive sites, both beginners and certified divers alike will be able to find the perfect conditions. The Spanish & Scuba Diving program includes Spanish lessons, all equipment, a package of 3 or 5 fun dives for certified divers, or a PADI course for beginners. For students interested in Salsa, Merengue or Bachata, our Santo Domingo school runs a ‘Spanish and Dancing’ course. The program combines 20 Spanish lessons/week with 6 to 8 lessons in the dance of your choice. Learn more about Spanish and Dancing in Santo Domingo. Students at our Sosua school can stay in the on-site residence, ideally located, just 5 minutes’ walk from the beach. 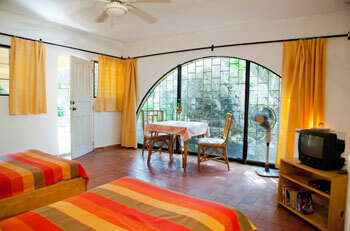 The residence is set in lush tropical gardens, each studio room with a private bathroom, TV, refrigerator and fan. Or, you can live with another student in a school-managed apartment, where you’ll share a fully equipped kitchen. Alternatively, our school can arrange accommodation in a high-standard, 4-star hotel in Sosua, located directly on the beach, with air-conditioning and swimming pool. 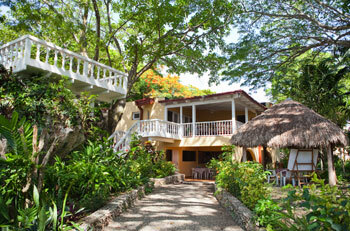 Accommodation is also available in bungalows, within the grounds of a pleasant 2-star hotel in nearby Cabarete. Our school in Sosua also arranges optional extra activities for students, such as scuba diving, surfing, river rafting, mountain biking, horse-riding, hiking, tennis and golf. The best way to get to our school is to fly to Gregorio Luperon Puerto Plata International Airport (POP). Transfers from the airport directly to your accommodation can be arranged at a reasonable price. Average score for our school in Sosua based on 18 previous client reviews. Very clean and basic. I suggested that a few minor things be replaced, like a pot and a knife. I did not need anything more. The night watchman Theo? Was super friendly and helpful. I had a great time. Due to the weather we did not do a lot of activities. Everyone was helpful and friendly. Both the language course and the dance course have exceeded my expectations. I have found an environment full of friends. The activities after classes were very interesting and they got me very involved. I particularly appreciated Sabrina's work, who was in charge of taking care of the students. Both the shared apartment where I stayed for some days and the studio were excellent. The environment of the school was very nice and well maintained, immersed in a park/garden. Also the environment of the dance school was better than I expected. All the teaching staff both at the language school and at the dance school did their best to make me feel a welcome guest. I would like to repeat this experience next November. Splendid Spanish course with an excellent teacher - Rosa. It was really nice to stay at the school. Simple but okay breakfast. Big rooms. You had every opportunity to talk to other students whenever you felt like it in the big garden surrounding the school. The teacher was extremely knowlegable and very pleasant to work with. It was a great wxperience and I would highly recommend Robert to anyone else. I really felt that I made progress after two weeks on the course and my only regret was that I couldn't stay longer. The course structure was grammatically based which I wanted (intermediate) combined with lots of opportunities to practise speaking using the grammar which had been taught. I stayed in a single bedroom/own bathroom accomodation on site. The room was cleaned every day and the bathroom was well equipped. A fridge kept drinks cool and there was a ceiling and bathroom fan. The room looked out onto beautiful gardens with mango, avocado and palm trees. The excursions which were planned by the school were fun and interesting. (horse-riding on the beach, visit to the city of Puerto Plata, visit to a lake with zip wire) to name but a few. The staff at the Languages school were very friendly and welcoming. My teacher was excellent and the school staff were friendly and helpful! I feel I was placed in an appropriate class for my level and the total immersion style of teaching forced me to use my Spanish. had a single studio with private bath. The room was a good size and it was nice to have a refrigerator. The furniture could use updating, specifically the bed and linens but overall the accommodation was clean, the area was safe and close to the beach. The grounds are beautiful with lush gardens and fruit trees.The student coordinator and other staff were amaaaaaaazing! They do a really great job creating a feeling of community for all students. They also did a great job giving students the opportunity to experience the culture of Dominican Republic and see the area. Fantastic experience, the school was extremely accommodating. In eight weeks I learned a lot and am so glad I was able to have this experience! The room in the apartment was clean and large, it was a great way to experience the city in a safe environment. I enjoyed my course. Our teacher made us comfortable with speaking the language, which we did a lot. I didn't think I had the aptitude but she showed me that anything was possible. I improved a lot in just two weeks. The onsite accommodations were good. Not luxurious, but adequate for what we need. Comfortable with wireless Internet and a fridge. Our tutor was excellent and explained everything very well. He also gave us plenty of chance to try our Spanish by repeating phrases. I would like to have stayed for another two weeks if I could. Very good teachers and very good staff: they all try to help you to have the best and they change the plans if you need something different. I lived for two months in a room at the school: very comfortable, very beautiful place, no problems and the staff make you feel very welsome in your accomodation. The staff was extremely helpful in accommodating my need for morning classes and even arranged private lessons as well as group lessons. The classes were really interesting and the time passed quickly. I wished I had been able to stay longer. The teachers rapidly assessed the students' needs and I certainly felt I had far more confidence in speaking he language.